Note to self … must set time aside each week to write in 2012. I’m really looking forward to this August Bank Holiday weekend, there is so much happening in and around Merseyside. The Mathew Street Festival will be in full swing in Liverpool with many local and international bands on stages throughout the weekend and part of next week. People will be lining the streets, enjoying the music, and soaking up the atmosphere. It’s all very nice, but for me, the highlight of the weekend will be The Wirral Food Festival. Unfortunately I can’t make it there for both the Sunday and the Monday which is a shame but the list of attractions for both days is extensive. 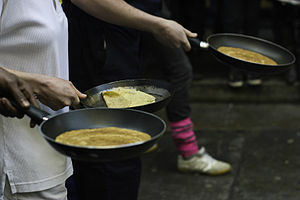 They’ve managed to get top chefs for demonstrations. To name a few there’s Paul Askew (The London Carriage Works) who will compare at the chefs stage, with Claire Lara (Masterchef The Professionals 2010/11) on Sunday and Rikki Vidamour (Young Merseyside Chef of the Year 2011, also of The London Carriage works) on the Monday. I’m looking forward to seeing Stephen Dougherty MCA (Lakeland Windemere) on Monday, his list of achievements is staggering and something I can only dream of emulating. I’d love to see the Curry delights at 12:30 on Sunday because of my love for a good curry, but I will be quite satisfied by the intriguingly named Natural Game on Monday morning. We’ll be spending a bit at the stalls and the Farmers Market, and I’ve just noticed that Cheshire Farm Ice Cream will be there so I might treat myself to one this weekend seeing as I’ve done so well with my diabetes. For the past week and a half I’ve had my head buried inside the book ‘A Taste of the Unexpected‘ by Marc Diacono, published by Quadrille Books. The title itself invites you into the book to discover what lies within but the cover also gives you a clue – “How to grow your own remarkable fruit, vegetables, nuts, herbs, spices and flowers”. I’ve previously tried my hand at the usual tried and tested crops of potatoes, tomatoes, peppers, onions, garlic, herbs, etc. and I’m quite happy with the results. I have to say, however, that if I hadn’t opened this book and started reading I would probably continue to blindly plant the same old things for the rest of my life. This book opens up new boundaries, it erodes the self-imposed limits that rule how we think about our kitchen gardens and introduces us to species that, I for one, would never have previously considered attempting. You can almost feel Marco’s enthusiasm emanating from each page as he talks about such exotic delights as Gojiberries and Szechuan Peppers. One of my own personal delights was the section on forced Rhubarb, my parents always had some growing around the base of a silver birch when I was a child, and it never failed to provide. Marco has provided the inspiration to try my hand at that and many other crops. Marco’s infectious enthusiasm is equally matched by the shared wealth of his experience, there is an abundance of advice provided for each crop. Each one is given an introduction, he then discusses varieties, growing and harvesting. You can clearly tell that he loves his plants but most importantly, from my perspective as a foodie, he loves eating them just as much. Each plant has a section about eating it, accompanied by couple of mouth-watering recipes. The advice ranges from how best to prepare it through to uses in the kitchen. Tempting recipes include Oca Saag Aloo, Stir Fried Pork with Kai Lun and Autumn Olive Jam (yes, that’s right, from olives grown in your garden right here in the UK). This is one book I would happily take into the potting shed, and be equally happy with it propped up next to my chopping board. I love chicken, you can cook it in so many ways and it’s used in so many cuisines. I’m usually putting it into curries, fajitas or stir-fry and serve it with rice, pasta or potatoes but when I’m not making a large meal out of it I’m making a sandwich. To make this all you need is a couple of chicken breasts, something to fill them with and some bacon to wrap it all up. If you want to you can top it with a little grated cheese near the end of the cooking, coloured cheddar is a good choice. Slice the chicken breast down the middle but don’t cut all the way through as you only need to make a pocket for the stuffing. If you can’t make a pocket in it then just slice it in two leaving one edge intact to allow you to open the breast out and fold it back over later. 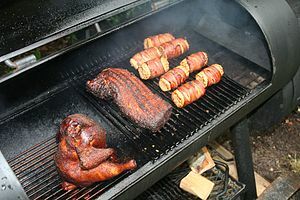 I find the easiest way to do it is line up the bacon on a board and place the chicken upside down on top of the bacon then fold the bacon over it or roll it. You can either use cocktail sticks to hold the bacon in place, wrap it in string to hold it in place, or do what I do and place the chicken in the oven dish so that the ends of the bacon are below it. Bake the for around 20-30 minutes at Gas 6/204°C/400°F until cooked. If you want to add cheese, add it in the last 5-10 minutes by sprinkling it over the top of the bacon. It’ll provide a lovely blanket of melted cheese on top of each portion. Once cooked remove it from the oven and either serve as whole portions or cut it into slices. You can use it for sandwiches when sliced cold or serve it with some pasta and a white or mushroom sauce. Everyone has a point in their lives that has a dramatic impact on them. It redefines who you are, what you do and how you live your life. Some people experience the phenomenon on more than one occasion, in my view they are the brave and fearless. For this post I digress from my usual topic of cookery because I have reached the point at which my life must change. Not because I want it to, but because I have to. “Thank you for the good that you do and for the difference you make to people’s lives”. It’s the everyday hero’s in our lives that make a difference to the way we live, but unless I change the way in which I live then I will inevitably shorten my lifespan considerably. The crux of the matter is that I have recently been diagnosed as Diabetic. It didn’t come as too much of a shock as I’d suspected something was wrong, I just couldn’t work out what. Now I know what I am up against I can take stock of my circumstances and learn how to fight and inevitably beat it into submission. I don’t see it as a case of my world is caving in, I’m more of the hit it hard and hit it fast until it submits sort of person. I’m not overly aggressive, I just think that you can beat most things with a good positive mental attitude and a little know-how. I am only just entering the learning process of how to manage Diabetes but at first glance it’s a learning process and a management process. That basically covers the management process. The learning process is probably the toughest. Some changes may seem daunting but if I can keep a positive twist to things then I can’t see any reason I can’t do this. One of the most important things is that it’s easier to achieve success if you’re not alone in the process, which is in part why I’m writing this post. The other is to let you know that if I skip a post or two, it’s not because I’ve run out of ideas, it’s because I’m too tired to think straight. Thankfully that last part isn’t going to last long, I’ve already started medication and it’s already having a huge impact, the thirst isn’t as bad and I’m not as tired as I was. And no, I’m not a vampire, but I do like a medium-rare steak now and then , which will probably be grilled instead of fried from now on. This brings me back to the future of this blog, or more correctly does it have one? 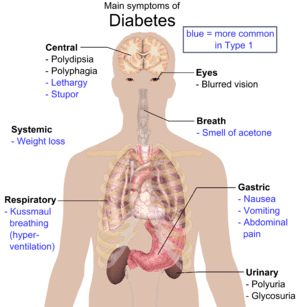 I can’t see how being Diabetic should affect the things that I post on this blog. I don’t know how many changes I need to make in my life, that will come to me as I learn about living with Diabetes. There is a mantra for this … eat well to live well … more on that in a future post I suspect. For a cake, biscuit and chocolate lover, I think having diabetes makes me a victim of my excess, something we, as a society, tend to ignore. I will continue to post stories about the things that I love to eat, or as of now, things I would love to eat but dare not – it’s a huge shame because I was going to make some chocolate eclairs over the May bank holiday weekend. I don’t feel too bad about having Diabetes, I hope we’ve caught it early and as long as I remain positive then I will overcome the illness. I think perhaps my girlfriend is more disappointed as the flow of cakes, biscuits and other goodies is going to dry up, not completely, but availability will be a problem. I’m also hoping that I can partake of a treat or two, we will see what the future holds for us. Diabetes UK is a very good site for information about diabetes. It’s only really social if everyone partakes of garlic bread, just make sure you’ve a packet of extra strong mints handy for the day after as well. I love a nice piece of garlic bread, but I don’t like the minuscule pizza parlour variety that’s about the same size as a small side plate, or the soggy mess that you get from using the prepared French sticks available in the supermarkets. I miss the round garlic breads I used to get about 20 years ago when I was in college, the closest I get to those are the stone-baked round garlic breads, which are I find are very thin and a little too crispy when cooked. To resolve the issues I have with them all I often make garlic bread from scratch. To do that I’ll use two methods, one involves pizza dough and the other utilises fresh bread. If I’m using a pizza dough, then the basic ingredients are pretty much the same as for bread, except for the proportions and I’ll substitute sunflower oil for olive oil. When I was working in London back in the 1990’s I used to make a garlic bread almost every time there was a gathering of friends. At the time I used to make it with White Rye Bread, the flavour of the bread is able to compete with the strong flavour of the garlic and I still think it’s the best bread to make garlic bread with. Peel the garlic, it’s easiest to use the broad blade of the knife over the close and press down firmly on the knife. Brush the pizza dough with olive oil, alternatively use some chilli oil but let people know you’ve used some. Using a pastry brush or the back of a spoon spread your garlic butter over the surface leaving about an inch clear at the edge of the dough to allow the crust to form. Slice the loaf into medium-sized slices but don’t slice all the way through the loaf, leave about a cm or two at the bottom. Part the slices and spread your garlic butter on each side rejoining the slices once done. Wrap the loaf in foil, shiny side against the loaf. Cook in a hot oven for 20 to 30 minutes (gas 5/190C/375F). One of the other things I do is to brush the top of the loaf with any remaining garlic butter and sprinkle poppy seeds over the top of the rye bread. You can use sesame seeds as well but I think the rye bread looks better with the poppy seeds. If you’re using a pizza dough, you can create a cheese garlic bread by topping it with grated cheeses such as Mozzarella and Cheddar, or slices of goats cheese or blue cheese. The only way to do that with a loaf is to mix grated cheese into the butter for spreading or to separate the slices and toast it under a grill spread with the garlic butter and cheese. BBQ season is upon us, or certainly was the other weekend and I’m hoping for more hot weather to come. Spring is in the air and the garden is starting to grow faster than I can trim it back. It’s time to rip the cover off the BBQ, freshen it up and fire up the briquettes. When I do a BBQ, I always have a selection of food both for the BBQ and on the table. Alongside some of that lot I’ll have some halved baked potatoes, boiled new potatoes, mixed salad (rocket, lettuce, shredded cabbage, tomatoes, spring onion, baby sweetcorn), another bowl with quartered/sliced boiled eggs or an egg salad, and a couple of bowls with dips, coleslaw and salsa. If there’s a lot of people I’ll prepare a couple of other dishes such as chilli con carne, casserole or soup that I can either put in the oven on a slow cook, put in the pressure cooker or re-heat on the day. One of the best ways of keeping the beer and wine cool is to utilise a small plastic bin or storage box and fill it with water and ice, cans will float and bottles can stand up in the box. If you need to you can always put another small plastic box in the bottom so you can stand your wine bottles on top of that to keep corks out of the water. Make sure you’ve some spare bottle stoppers available to stop any pesky bugs from sharing your drinks. For a typical marinade I’ll usually start with an oil base, usually olive oil or sunflower oil. If I want a nuttier taste I’ll use walnut or sesame oil, if I want to produce a thick paste I’ll use butter instead of oil and rub it into the meat. To that I’ll add tomato sauce or a tin of chopped tomatoes, Worcester sauce or Soy Sauce, a small quantity of stock or an OxO cube in some boiled water, salt and red & black pepper. Then I’ll add the spice mix, so this will either be a couple of tablespoons of curry powder or curry paste, teaspoons of chilli powder or any other spice mix (Cajun, pre-made beef seasoning, chicken, etc). If you’re feeling brave add in a couple of drops of hot chilli sauce, there are plenty available and I’ve usually got a bottle of Econa or Tabasco in the cupboard. To marinade the meat you need to score it with a sharp knife to help it absorb the flavours and leave them coated in the sauce overnight in a covered container in the fridge. I use the same sort of mix for a cooked sauce, if I’m preparing one for the BBQ I’ll start with some sliced onions, peppers and mushrooms in oil, if I’ve any off-cuts of meat I’ll use those as well, and add a little sugar to help it caramelise in the pan. I sometimes replace the stock liquid with a bottle of ale. I mix in the marinade ingredients mentioned above to a Roux to create the desired sauce, I look for quite a thick sauce for a BBQ. Strain it into a jug, chill or serve hot. If I’ve made it just before the BBQ I’ll also put the vegetables I’ve used to make the sauce into another container with a spoon so that people can top their burgers with the mix. Knowing how many people are turning up and whether there are any personal tastes or allergies you need to cater for is a huge help so get to know before hand where possible. I find it’s very easy to buy too much for a BBQ, one of the ways around that is to suggest people bring something to contribute to the party. If you’re going to do that, ask people what they’re likely to bring along, make a list and cater for the difference.